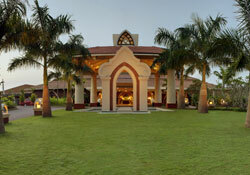 The Ramada Caravela Beach Resort, Goa is the place which signifies comfort and luxury blended together. The strategic location of the hotel takes it close to the exciting White Sand Beach in Goa. The place is one of Goa's most cleanest and secured places. The hotel is best known fro its captivating Cascading Waterfall that covers the lobby while a waterscape Pool forms a lagoon. The heritage of Old Goan architecture clearly reflects on the architecture of the hotel. The location of the hotel also brings in the fun of the market place quiet close to the customers. Among the best Luxury Hotels in Goa the Ramada Caravela Beach Resort offers 202 exquisitely designed rooms filled with the best of the facilities. The rooms at the hotel are very spacious and provide the best of the luxuries. All the rooms are attached with a balcony giving the stunning views of the sea and the white beaches. There are many suites as well for a more luxurious stay. For dining propose the Ramada Caravela Beach Resort in Goa offers an array of restaurants that offers the best from all over the world. For business purposes the Ramada Caravela Beach Resort, Goa offers the facilities of 2 meeting rooms with an area of around 400 sq feet. The venues are simply perfect for meetings, conferences or any other occasion. The Ramada Caravela Beach Resort, Goa provides the facilities of 9 Hole Par 3 Gold Course, a spa with Ayurvedic treatments Yoga, Tennis Courts, Discotheque, Casino and Seasonal Wind Surfing or Parasailing. The exciting place of Goa is the place visited by thousands from all corners of the world and in thousands. The long stretches of beaches and the exciting activities attached to the place makes every moment a pleasurable one. The place offers great markets fro the shopaholics who have a taste for unconventional things. The place is also a favorite among the fun seekers.